About a year ago I applied for an allotment and just this week got the call to say there’s one available. Allotments are a very British thing. They have been around for hundreds of years, since Anglo-Saxon times, according to The National Allotment Society. In Victorian times they were handed over to poor people as a way for them to feed themselves. During the second world war they became an important food supply for the nation; “Dig for Victory” was the slogan at that time. Everyone was encouraged to grow vegetables and parks everywhere were converted into allotments for this purpose. Most of us have enough food to eat today but allotments are still very popular and some people sit on waiting lists for years before they get one. I think it’s important for communities to grow their own food. It builds resistance for times of need and it will play an important role in mitigating the effects of climate change. Growing your own vegetables is also intensely satisfying and good fun. I don’t plan to dig up all that grass. I think I’ll try the no dig approach or lasagne gardening, as I think it is also known. Posted in Journal and tagged allotment, allotments, British, digging, gardening, gardens, vegetables. Bookmark the permalink. Thank you, Norman! I’m sure I can’t make it any worse. My sister has an allotment in York. I think you’ll have a great time on yours with your kids, growing your own food, and it’s great work out too! I don’t know why they took so long to offer it to you, as it looks like the previous ‘tenants’ have done very little on it for quite some time! Maybe the previous ‘tenant’ pleaded with the council to hang onto it but then still never did anything? 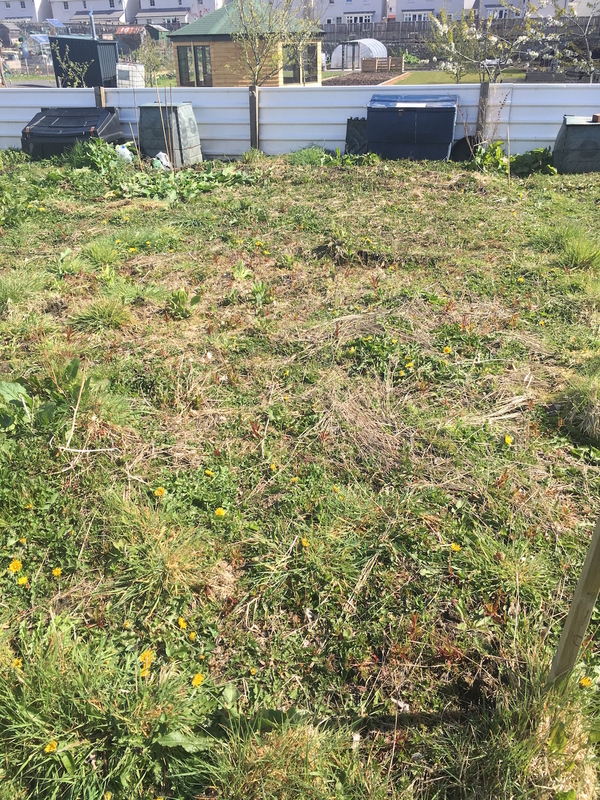 I think they check up once or twice per year and for the allotments that look unkempt they’ll contact the tenant to see whether they want to keep it. Ah, I hadn’t considered that and I’m sure it’s true. It feels like there’s a lot of community at allotments and maybe it’s being part of that as much as tending to the garden itself. Thanks, Chait! I will definitely take lots of photos. So pleased you have a plot! I’m sure it’ll be bursting with veggies and fruit in no time 🙂 I read that the lasagne method is much better for soil structure and the bugs. We don’t ever dig the garden at home and the soil is always full of big fat worms. Thank you! Your allotment looks fantastic! Congratulations. You might enjoy this. I win on the sadness of the state it was in when taken on. That looks great! Thanks for sharing. Did it take you long to get your allotment back into shape? Did you have to do a lot of digging? Digging – yes I did. This was because I had a lot of bindweed which is hell to get rid of and I didn’t want to use a herbicide on it. Because of that I didn’t really investigate “no-dig”, but my understanding is that you put a top dressing of compost over what you have, which you might find easier with raised beds – one of the recurring themes in my blog is stuff I’ve salvaged from skips, which can be a useful source of free wood. I would have thought you will also have to do some digging if you decide it needs organic matter (manure) since you need to work it in. I started in August 2015, which is a really bad time of year to start, so I didn’t plant anything until September/October time. But it really was in a bad state and so I worked on it bit-by-bit, and got most of it ready for March 2016 and have got the final bit of land into production this March with potatoes. Having said all that, I’m really a just novice learning as I go; the best thing (obviously) is to make friends with some of the experienced plot holders and pump them for info.